Kristin’s passion for the ocean commenced at a young age growing up frequenting the National Aquarium, Ocean City and the Chesapeake Bay in Maryland. 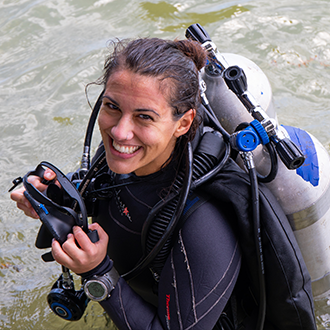 She overcame her fear of scuba diving as a student at the Island School in Cape Eleuthera, Bahamas, later inspiring her to become a scuba instructor to help others who have similar anxieties be able to conquer their own fears (above and below the surface). Kristin is a graduate of Duke University’s Nicholas School of the Environment and recently completed her Masters in Anthropology at the University of Colorado Denver. She has spent the last two years conducting research in Baja California Sur, Mexico, exploring the use of visual ethnography to study the complexity of shark fishing. She hopes that her interdisciplinary background in environmental science and cultural anthropology will add a unique perspective to the Changing Seas Production Team.